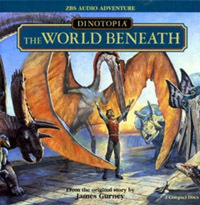 Last week we began airing the first episode of the serialized audio dramatization of Dinotopia: The World Beneath. During this week we launched Episode 2, but sorry, it's no longer available. In this episode we meet Lee Crabb again, who offers Arthur some advice about traveling into the World Beneath. I painted the standing portrait of Oriana from a live model in my studio. Both are in oil. 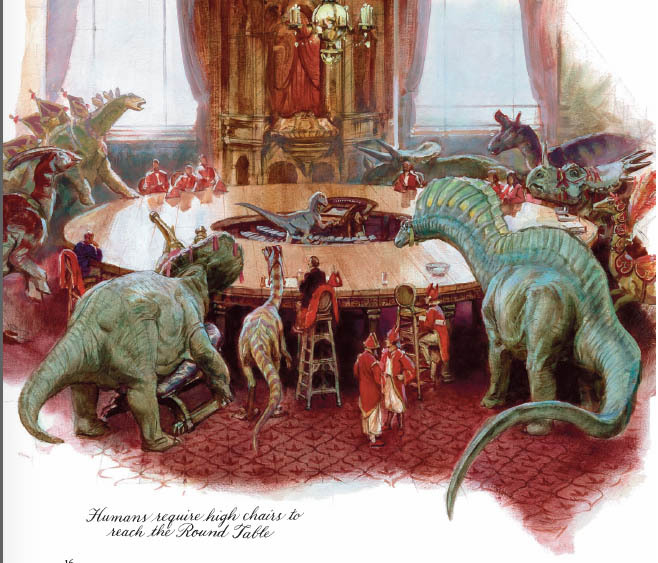 When Arthur calls a Round Table meeting, the humans sit on high chairs to be at the height of the dinosaurs. Producer Tom Lopez did an amazing job of creating the strange sounds of all the dinosaur voices. 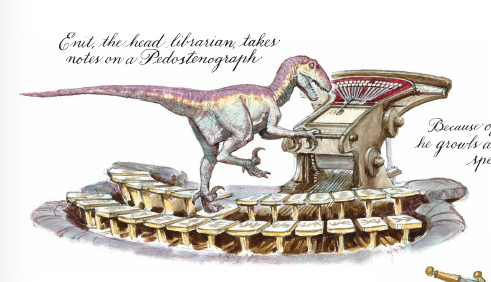 Enit the librarian operates the pedostenograph machine. Arthur shows a part of a key that he believes will get him back into the caves. This acoustic adventure was produced by Tom Lopez, mastermind of the ZBS Foundation, with an original music track by composer Tim Clark. Episode 3 arrives in a week. Each short episode will only be live online for one week, and then it will disappear. If you'd like to purchase the full two-hour World Beneath podcast right now and hear all fifteen episodes back to back in a feature-length production, check out The World Beneath at ZBS Foundation website for the MP3 download. It's also available as a CD. You can also order the original printed book from my web store and I'll sign it for you. (Ships via Media Mail within 24 hours of your order. US orders only for the book, please). The book is also available from Amazon in a 20th Anniversary Edition with lots of extras. 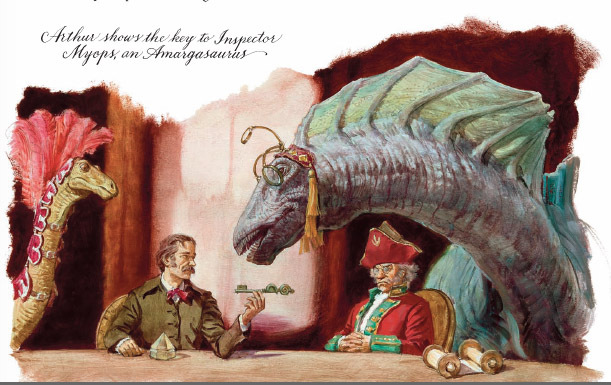 Many of these paintings will be on view at the upcoming Dinotopia exhibition at the Stamford Art Museum and Nature Center, Feb. 14-May 25. I'll be in attendance at events on Feb. 28 and March 1. Read more about the events here on this blog.